JoAnn’s is having another sale. Simplicity patterns are 5 for a dollar and thread is buy one get one free. I needed more thread for the clothesline bag. That project has been a monster for me. I’ll get to that when I have a photo to post. I found several patterns including these two Project Runway ones. I also bought a couple patterns to make holiday gifts. One is for pin cushions I plan to make for my sewing students. There were a ton of clearance buttons for 50 cents a card. 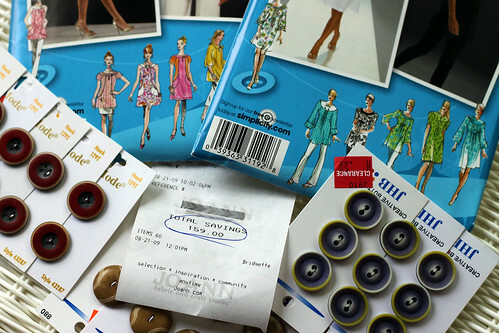 Buttons can add 15 dollars to the cost of a shirt or dress. If I can find matching cards of 8 to 10 buttons; I stock up for the future. I think I am good now until about 2030. Notice my savings. Rick always says I would save more if I didn’t shop the sales. This entry was posted on Saturday, August 22nd, 2009 at 3:00 am and is filed under Sewing. Tagged: Sewing. You can feed this entry. You can leave a response, or trackback from your own site.